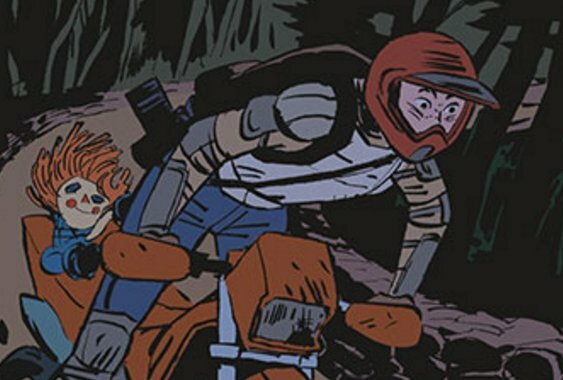 Today marks the launch of Spill Zone, a graphic novel from Uglies creator Scott Westerfeld (previously) and Alex Puvilland: the tale of a brave photographer who ventures into strange, uncanny lands created by a mysterious catastrophe, and returns with images of those worlds that she sells to keep her scarred little sister whole. The comic is being syndicated online in six-page installments (25 pages went up today! ), and will be collected between covers in a Firstsecond book next May. I just pre-ordered my copy, based on those 25 pages. I’ve always been a sucker for tales about exploring broken, abandoned terrain. As a kid I was an “urban explorer,” thought we didn’t have that term back then. I spelunked the buildings at my upstate New York college, and I’ve explored abandoned sites in and around NYC since. There’s nothing quite like the silent loneliness of a place that has been abandoned, restricted, and left to ruin. In these spaces, the usual rules don’t apply. It feels as if the laws of physics don’t either. My heroine, Addison Merritt, isn’t just taking strange photographs. She’s rebuilding after the fall.